In the final homestand of a successful season, the ninth-ranked University of Miami women’s tennis team routed the Virginia Tech Hokies in a 7-0 demolition. Seniors Anna Bartenstein and Gabriela Mejia exited Schiff stadium Sunday with doubles and singles wins to show for the match and two illustrious careers nearing the end. Sunday’s match marked Mejia’s first match listed with her new surname, Mateus, after she exchanged wedding vows Saturday. The Canes took an early lead after securing the doubles point with decisive wins from all three doubles pairs. UM continued to dominate the courts in singles play with quick wins from No. 25 Mateus (6-2, 6-1) over Virginia Tech’s Shannon and No. 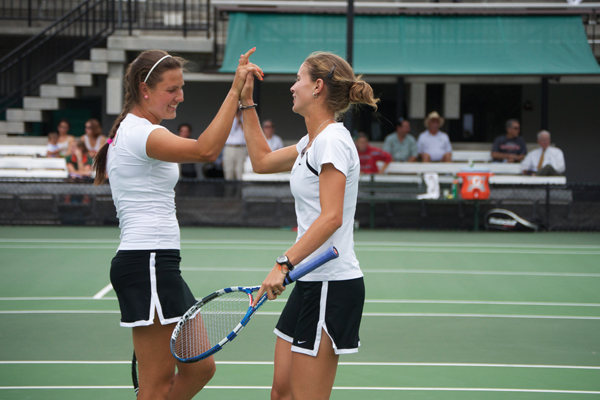 61 freshman Lina Lilekite (6-1, 6-2) against the Hokies’ Courtney Rauscher. Zimmerman and Bolivar each took their matches in straight sets. Zimmerman prevailed 6-1, 6-2 over Carol Kahoun while Bolivar defeated Tea Ivanovic 6-1, 6-4. Bartenstein closed out her home career as a Hurricane with her win over Martha Blakely while Dubins completed the 7-0 sweep after defeating Katie Blow 6-2, 6-4. “It was exciting, I was very nervous, I’m sad that it’s kind of over, but we still have a lot of matches in front of us with the postseason, ACCs and hopefully nationals,” Bartenstein said of her final match in Coral Gables. Coming off a rough series the previous weekend in North Carolina with losses to UNC and Duke, the Canes prepared mentally and physically for the final home series of the regular season. Bartenstein highlighted the importance of focus on both the individual and team scale. “Personally, I wanted to keep my focus, play point by point and not think so much about when I miss or don’t play my game. As a team, we have been trying to play on our terms,” she said. Sunday’s victory followed Friday’s 5-2 win over No. 15 University of Virginia. The two seniors were honored before the match. Mateus, Bartenstein, Lilekite, Bolivar and Dubins each contributed singles points in Friday’s victory. The Hurricanes will enter the ACC tournament in Cary, N.C. on Thursday. Their focus will be simple: “Keeping things the same, keep the game up mentally, physically, because school will also get a little tougher at the end, I think if we keep the same focus we will be fine,” Mateus said. Mateus departed Schiff stadium for the final time with advice for the young team.